ACR89U-A1 is the latest addition to ACS’s strong line of Smart Card Readers with PIN-Pad. It is an upgraded version of ACR88, offering better performance, longer battery life and lower energy consumption. This versatile handheld smart card reader runs on a 32bit-MCU and has a built-in keypad, 128×64 LCD, LED indicators, buzzer, dual full-sized smart card slots, 3 SAM slots and rechargeable battery. 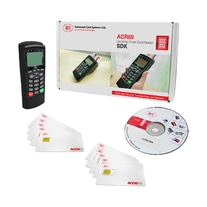 Through those features, ACR89 enables users to perform secure smart card transactions in both office and field environments. ACR89U-A1 comes in a complete Software Development Kit (SDK), which contains vital components for the development of customized smart card applications. The SDK provides sample applications, tools and utilities, and sample codes, enabling users to conveniently and effectively incorporate ACR89U-A1 into their solutions.